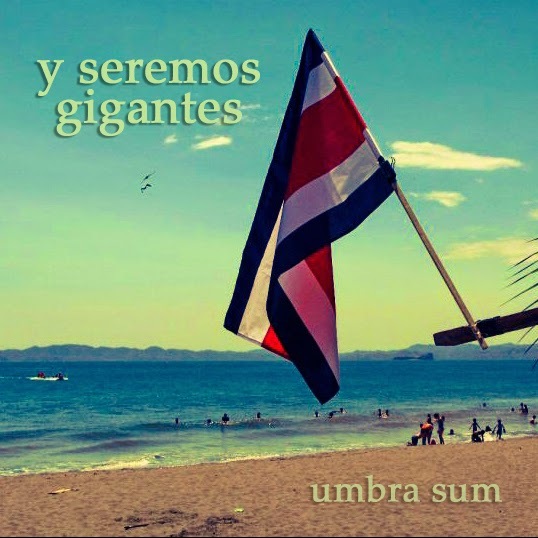 Umbra Sum: The story behind "Y seremos gigantes"
The story behind "Y seremos gigantes"
Last year, when Costa Rica was on the brink of qualifying for the 2014 World Cup in Brazil, I publicly promised to compose a song in honor of the Costa Rican national soccer team if it solidified its participation in the tournament (although there was no one who would hold my feet to the fire if I never followed through with said promise). While Costa Rica had made it to a handful of World Cups in the past, something about our country’s presence this time around was unlike previous tourneys. Although I do not currently reside in Costa Rica, one could catch the lingering wake of the advertising appealing to our past achievements, including Costa Rica’s participation in the 1990 World Cup. On June 20th of that same year in Italy, Costa Rica defeated Sweden 2-1 to secure its place in the knockout round for the first time in our country’s history. And though we didn’t make it into the quarter finals, from that moment on, nostalgia arrived and never left. With each World Cup the ghosts of Italy 1990 appeared only as a reminder of that singular feat. Back then, our "Sele” demonstrated courage previously unknown in our country, and the country rose to new heights that augured a bright future for Costa Rica on the international pitch. Sadly, all attempts to reach those glorious heights would relentlessly end in varying degrees of failure. However, it seemed that the ghost of Italy 1990 had shaken off its ominous presence and morphed into a specter of hope in 2014. The months preceding the World Cup in Brazil, the atmosphere wafted with unaccustomed pride. The National Symphony Orchestra of Costa Rica clamored an epic battle cry announcing the upcoming soccer battles; the documentary Italia 90 premiered mere weeks before the first kickoff, once again treading the same glorious path of our Costa Rican platoon and its campaign in a foreign land. Amid the fevered daze of the World Cup, I recorded my song with some hesitation. Despite the good will of the Costa Rican people, I doubted that our country would achieve anything worthy of plaudit. I am happy that I was wrong. When I started to plot out the song for Costa Rica, I knew that I would be incorporating a fragment of the radio broadcast that Mario McGregor and Javier Rojas, two radio sportscasters for Radio Columbia in Costa Rica, did of the aforementioned Costa Rica-Sweden match. This was a candid and poignant narrative, abounding with rare nationalism. Initially, I wanted to underscore the perils of nostalgia: a way to expose the infertile and trivial discourse brought about by fleeting patriotism. I had titled the song “When We Were Giants” (“Cuando fuimos gigantes”), since I believed Costa Rica would remain in the shadow of its past glory. My wife said that the title was cynical and pessimistic. She was right. Optimism was inescapable: hope had already set its course. Amid the frenzy of dreams, it was possible to believe that Costa Rica could triumph over adversity: that this small, unknown and underestimated Central American country could stun the world. To think that our country could be a world power: a contender and not just a mere tourist attraction with its “pura vida” motto and unassuming pacifism. The title became “We Will Be Giants” (“Y seremos gigantes”). And so it came to pass. Today the giant stands and its name is Costa Rica. History has consecrated its new heroes: men who made us dream; live in the daze of victory and shed the impossible tears of joy. We are grateful to these heroes for giving us faith, pride and courage. In the same fashion, I would like to thank several people for helping make this song possible. First, my wife: for her optimism and support in the undertaking of this and all other Umbra Sum ventures. Second, Columbia Radio and Agnes Fajardo, for granting me permission to use the audio from the broadcast of the Costa Rica-Sweden match. Finally, I owe a very special thanks to Francisco Brenes and Gustavo Verduzco of Edición Limitada; Daniel Ortuño of Findependiente; and Alessandro Solis of La Nación for their support by playing/sharing the song through their respective media outlets. Lastly, thank you to everyone who heard the song and shared it.